Thank you for your invitation to reward and evaluate your web site Tim's Spider corner. It was a great pleasure for us to see your beloved eating spiders and to learn about their life & love. brrrr... Love is sometimes dangerous for the lover, as the spider girl eat him as dessert. What a wonderful site! All is perfect: the color, the navigation, the valid xhtml and CSS, even the smallest point. 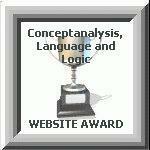 This Award is our highest honoring, your web site deserves it! Congratulations and keep up your pretty work! This site contains all the elements that a recipient of our highest honor should contain: well designed, easy navigation, required content, pleasing graphics. However, what I found interesting was that as someone that is not fond of spiders I found that I became intrigued with them after reading the information on this site. How great is that? I found the examples for flash refreshing (rather than just the links to other resource sites). Furthermore, this site can clearly win its own AP. A great site well deserving of this award. Your web site, Tim's Spider Corner, has been selected as the 2004 winner of the Internet Beacon Diamond Award. Every December, the Diamond Award is presented to a Gold Award winner from the previous year which, in my judgment, best exemplifies the spirit and purpose of the Internet Beacon Awards. This year, it's your site. Congratulations, once again, on an outstanding web site. Your web site, Tim's Spider Corner, has qualified for an upgrade to the current Internet Beacon Gold Award. This is the same excellent site that I remember. I think I probably used up all of my complements the last time around! Spiders are not really my area of interest, but this is a terrific resource for anyone who enjoys them. Congratulations, again, on an outstanding website. We are pleased to announce that your site is a silver recipient garnering 89 of a possible 100 points. We enjoyed our time evaluating your excellent site, Tim's Spider Corner. An amazing site containing a wealth of information about spiders. A well-put together site that was a pleasure to review. I am happy to say that your site has been awarded with 'The Firestarter Site Of the Year' for 2005. We have enjoyed visiting your site again and we feel that it best displays the objectives of our program. Please find attached our coveted award and certificate. I am pleased to award you with my Gold Award! I really enjoyed my visit – it was a pleasure. Your website is wonderfully designed, with tasteful colours and graphics. I enjoyed reading about the spiders and especially the "love kills section"! I wanted to get this out before Christmas. You were the clear winner of this and last months applicants that I consider for my Diamond Award. Thank you for visiting my site and applying for an award. I have visited your site today and think you have done an excellent job! Therefore, it gives me great pleasure in presenting you with the Award of Excellence–Gold. Your site is a TOP Award winner of the Korea Award Program. You received a score of 96 points from Five Judges of the Korea Award Program. Congratulations! Your site Tim's Spider corner has been accepted as a winner of Korea TOP Award – Awards No. KAP–T–0403. We were impressed with your site as a great contribution to the internet. Your site has nice design and wonderful navigation also great your work. Our awards are not easy to win so keep up the great work. This website is giving an excellent first impression. The navigation is excellent and easy to follow. The choice of colors and fonts is excellent. The text is easy to read. The photos are of high quality. The content of this site is outstanding, huge, informative and educational and presented on short easy–to–read pages. The coding is error–less and exemplary. The use of xhtml 1.1 and CSS is terrific and an example for others to follow. This is in my opinion a website of excellent quality with clean and appealing design and layout. The trouble with the coding on the front page is gone and the page is now working fine in both MSIE and NN. 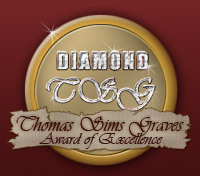 It is with great honor and humility that SFG Awards, awards you our Diamond Award. Your site continues to be a shining example of everything that is great in a site and I hope that you will accept this new award as a symbol of all the hard work that you have put into your site. 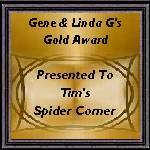 I'm very pleased by announcing, that your site Tim's Spider corner is a winner of my CLL Website Award. Also, thank you very much for inviting me to evaluate your excellent site with so interesting and fascinating content of spiders world! Your site is a very harmonious combination of smoothly and pioneering design complying with high coding standards, and of solid and detailed collection of knownledge about spiders' life. Navigation is easy to use, and very functional, relevant and exhaustive. Pages are proper–sized with high consistency. Backgrounds, colors and fonts are well selected and calm. In its entirety your site is very pleasant to visit and its, maybe a bit unusual, content is expressed with a very interesting, detailed and carefully way. Your site Tim's Spider corner has been accepted as a winner of Korea Info Award. We were impressed with your site as a great contribution to the internet. Your site has wonderful navigation and contents. Our awards are not easy to win so keep up the great work. After our review of your site, we have determined that you have met or exceeded all of our award requirements. During my visits, I found that you complied 100% with our mandatory criteria. In addition you scored 98 points out of a possible 100. Thank you for the opportunity to evaluate Tim's Spider corner. We had a very enjoyable visit and we are appreciative of your efforts to bring quality viewing to the Internet. Congratulations !!! Your site was chosen as Absolut Site of the Year 2003! We wish to remind you that this year we had 3568 applicants for this award, but only three sites share it which means: 0,08%! – Your site with unique concept, design and interactivity belongs to this rare diamonds of the net. You have our deepest respect and congratulations. Our judges wrote about your site next: The author shares his love of spiders with a heart that makes sure that even if the surfer doesn't share the interest they will explore the site deeper. Tim has developed a very good eye for design and the flash menu is outstanding! Defiantly, this site will attract your emotions, artistic feelings, and you will visit them again and again. You can proudly display our award graphic on your site with pride, because you deserve it with your important, unique, inspiriting and creative works. We the staff of Keepsake Awards would like to congratulate you on an excellent web site. After our judges review we are pleased to present you with our Silver Award. Our criteria is very strict and to achieve an award means that your site is a Keepsake for generations to come. Thank You for applying for our award as it was a pleasure to review. Hello, It is my great pleasure to inform You that Your site has won a very valuable award, the ABSOLUT VANGUARD AWARD. By this occasion I wish to remind You that this award goes only to 2% of all applicants. That, for sure is a remark of quality of Your site. Our experts team are from different parts of the world, different traditions, cultures, and to all of us it had been a great pleasure to evaluate Your site, to enjoy it's concept, content, design and unique impression. Please, understand this award as a stimulants to your creative and useful work. Your site Tim's Spider corner has been reviewed by all our judges. We enjoyed our visit to your site and we are pleased to announce that your site has won our Silver Award. You have obviously put a lot of thought and work into the design and in maintaining your pages. Your site has gained the Ruth's Haven Gold Award. The site is very interesting and very well set out. I have now completed the review of your site. I am very pleased to present your site with the Deb's Gold Award. Thank you for giving me the opportunity to review your work. It is very well designed, very easy to navigate, good resourceful content for people who are interested to know more about spiders, and makes a good contribution to the www. Your site was very well presented and the information presented shows clearly that you know your subject. It shows a great amount of research as well. I was so impressed that I have decided to offer you my highest award, my Platinum award. I was very surprised when I saw how many spiders there are. It tooks a lot of time to collect this information. Also the short movies displayd on your site where very funny. I visit your site on a regular basis and found out that evertime something change on your site, for a job well done I award you with my Golden Award. You inform cheerfully prize winner that chose of my "Korea Orchid Gold Award". I have visit your site several times and I am very glad to present you with my "Korea Orchid Gold Award". As You have worked hard on your site. Congratulation to a job well done.